Linfield were crowned league champions for the 53rd time as they got the point they needed against Crusaders at Windsor Park on Saturday to claim the Gibson Cup. 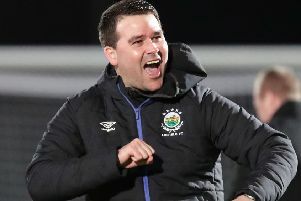 It wasn't pretty but this scoreless draw sealed the Danske Bank Premiership title for David Healy's side after his side kept 21 clean sheets during their league campaign. The title win will also be a weight off Healy's shoulders after the disappointment of last season when the Blues failed to get their hands on any silverware. As for Crusaders they will now focus on their Irish Cup Final clash with Ballinamallard United after being dethroned as league champions. It was a good lively start from both sides in this encounter and the Crues were looking to get off to a positive start at Windsor. The Blues only only need a point to claim the Gibson Cup looked hesitant and nervous in the opening exchanges. In the 14th minute Daniel Kearns tried his luck for the Blues. His effort was well struck but his effort flew over the Crusaders bar. Eighteen minutes and neither side had really threatened and a goal for the home side would maybe settle the nerves, however the Crues were not ready to give up their title just yet. The Crues Ronan Hale let one fly from the edge of the box. Linfield keeper Gareth Deane reacted well as he smothered the shot. The champions elect were looking edgy and jittery after 25 minutes and skipper Jamie Mulgrew would have to drive his side forward if they are to get their hands on the Gibson Cup. The Crues had a great chance to take the lead in the 26th minute. A Paul Heatley ball was deflected by Phillip Lowry and Deane did well to block with his legs. Linfield's Mulgrew then went down in the Crues box after a surging run but the referee waved play on much to the anger of the Linfield faithful. In the 31st minute Ronan Hale hit a shot from distance that went straight at Deane in the Linfield goal. Ten minutes before the break Linfield's Chris Casement had a go from a free-kick. His effort however did not trouble Doherty in the Crusaders goal. It was a poor execution from the Blues defender. Linfield upped the pace as the half came to an end and were putting the Crues under more pressure with Mulgrew getting on the ball more - while Joel Cooper and Jordan Stewart had come to life. The second half started at a good pace but neither side created a chance of note in the opening five minutes. Heatley then had a great chance to open the score in the 51st minute. He raced clear of the Linfield defence - who he left in his wake - before his shot was stopped by Blues keeper Deane who stood his ground. The Blues were awarded a penalty in the 53rd minute as Sean Ward was penalised for handling the ball in the box. Stewart stepped up to hit the penalty but a flying save from Doherty denied the Blues from taking the lead.It was a good save from Doherty but Stewart should have given the Blues the lead. Linfield came close again in the 66th minute from a corner. Ryan McGivern's headers being pushed over the bar by keeper Doherty. It was all Linfield and they were really pushing for the opener as the Crues started to sit deeper and deeper. It was looking as if we were going to get a grandstand finish as both sides were still looking to get a winner with ten minutes left but neither could make the breakthrough. Subs not used: Conor Mitchell, Mark Stafford, Matthew Clarke, Kyle McClean. Crusaders: Gerard Doherty, Howard Beverland, Colin Coates (Forsythe 74mins), Phillip Lowry, Sean Ward, David Cushley (Jordan Owens 75mins), Declan Caddell, Michael Ruddy, Paul Heatley, Ross Clarke, Ronan Hale.